The NATO medal on the left is awarded for various activities; the one on the right is awarded for service in Kosovo. The NATO Medal has been approved for acceptance and wear by soldiers and other U.S. military members who have participated in Operation Resolute Support, the North Atlantic Treaty Organization mission in Afghanistan that began Jan. 1, 2015. To qualify for the decoration, which is officially designated the "NATO non-Article 5 Medal," soldiers must have been awarded the medal by NATO headquarters, or a NATO theater commander who has been delegated award authority by the Supreme Allied Commander, Europe. 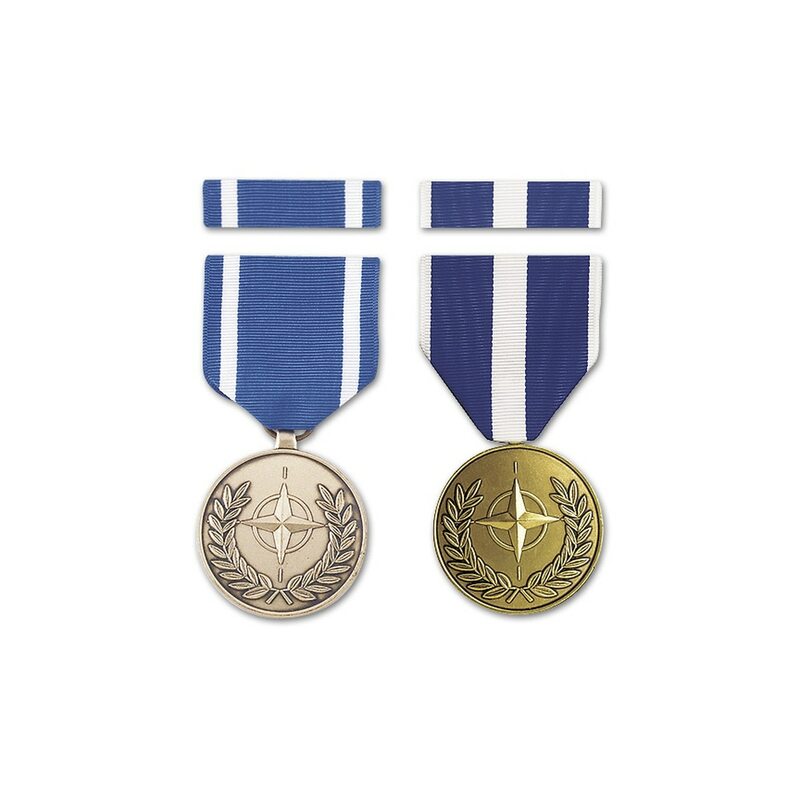 As provided by a NATO representative, the medal may include a ribbon clasp denoting the specific operation for which the award was made. Soldiers are authorized to accept and retain the ribbon clasp, but they are not allowed to wear the device. Soldiers are only allowed to wear the basic medal and service ribbon. A bronze service star should be affixed to the NATO Medal suspension ribbon and service ribbon to recognize participation in subsequent Defense Department approved NATO operations. In accordance with the Army's military awards regulation, AR 600-8-22, the NATO Medal should be worn immediately after the United Nations Medal, and before the Multinational Force and Observers Medal. • Operations in the fFormer Yugoslavia, Nov. 14, 1995 – Oct.12, 1998. • Operations related to Kosovo, Oct. 13, 1998 – Dec. 2, 2002. • Operation Eagle Assist (airspace of North America), Oct. 12, 2001 – May 16, 2002. • Operation Active Endeavor (Mediterranean Sea), Oct. 26, 2001 – TBD. • International Security Assistance Force-Afghanistan, June 1, 2003 - Dec. 31, 2014. • Operations in the Balkans, Jan. 1, 2003 – TBD. • NATO Training Implementation Mission-Iraq, Aug. 18, 2004 – Dec. 31, 2011. • Operations Allied Provider, Allied Protector and Ocean Shield, Jan. 2008 – TBD. • Operation Resolute Support-Afghanistan, Jan. 1, 2015 – TBD.